Time for part deux of my Japan adventures last month! 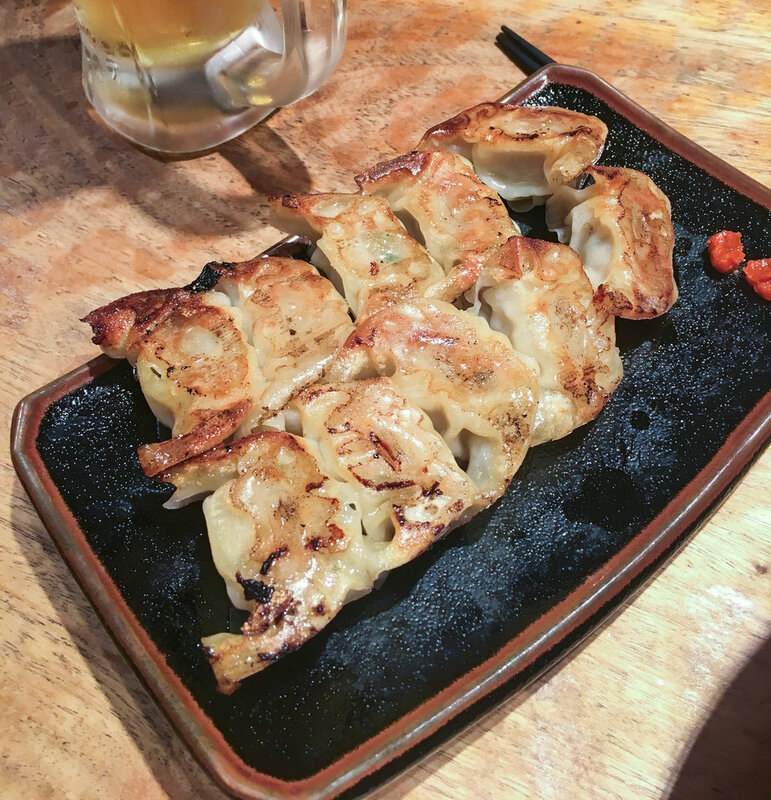 For part 1, check out this post to see what I saw and ate when I was in Tokyo with my mom for a week. After leaving Tokyo, we visited Kyoto for 5 days and Nagoya for two. Kyoto wasn’t bombed during WWII - apparently the Secretary of War had gone there for his honeymoon and scratched it off the bombing list. Because of that, most of it’s shrines and temples are intact and it still retains a lot of it’s historical character. Staying in Nagoya was a bit of a mistake – my mom was looking for a place halfway back from Kyoto to Tokyo to split the train ride down, but it’s basically a big commercial city with not a ton to see. Still, we made the best of the two days and discovered a couple great sights, and I ate the best ramen I had of the trip! Thanks to my mom and her Mariott point hoarding skills, we got to stay at the Ritz, which was pretty incredible. We ate dinner there the first night, planning to get a kaiseki (traditional multicourse meal), but the a la carte dishes look a lot more exciting. With kaiseki style dishes, the food looks beautiful, like a piece of art, but the tastes are very subtle. My mom eating the very first raw tomato of her life. I kid you not. The woman has probably tried every possible organ meat and every cuisine, but did not eat a raw tomato until this moment. Today was a fun foodie day. We started with a tour of Nishiki market. According to the guide, it's gotten a lot more touristy, but I don't mind because in this case touristy means you can try all the things! I especially loved seeing all the different pickles, which are usually pickled with rice bran or sake lees, the leftover rice from making sake. Lunch was one of the best meals of the trip, an all yuba feast near the market at Kappo Misen. Yuba is the skin that’s formed when making tofu. It’s usually sold dried, where it’s rehydrated before eating. In our meal, we got to try yuba lots of different ways, but the fresh yuba was definitely the best. It was SO creamy, like fresh ricotta! After lunch, we split from our tour group and went shopping. I picked up some pretty washi paper to hang in our house almost threw all my money away at the Japanese version of Anthropologie. In the late afternoon, we took another tour of a few geisha districts, led by a professor of Japanese history. It was really fascinating to learn about geisha culture, and the amount of training that goes into it. There were a ton of restaurants in Gion, one of the geisha districts, so we just popped into one for an unagi dinner. All I could think of while eating it was Ross on Friends - please tell me you remember the unagi episode! Today we took a day trip out to Nara, a UNESCO World Heritage Site and capitol of Japan in the 700s. It's famous for it's temples, and it's very friendly (and hungry) deer. We took the tour with Context, which was fantastic because we were paired with a Japanese history professor, Buddhist priest, expat, conscientious war objector, and generally one of the cooler 70/80-something year olds. He took us to Todai-ji, a Buddhist temple with a 15 meter high Buddha inside, one of the gardens (where we stumbled into a geisha show), and Kasuga Shrine, a famous Shinto shrine. He also didn't (obviously) judge me much for wanting to take selfies with the deer. For lunch we stopped at a soba noodle shop where they sold buckwheat noodles prepared a ton of different ways. Since it was so hot out, I passed on soup and went with cold soba noodles, which are served with super crispy tempura and a couple sauces for dipping. Back in Kyoto, we went out for dinner and stumbled across a street that had what looked like a ton of really cool Western-style restaurants (think hip Brooklyn eatery, not Chili's). If you're in Kyoto, the street is named Kiyamachi Dori, and although I can't remember the name, I highly recommend for more unique yakitori (grilled skewers) and THE BEST MOCHI DUMPLINGS EVER. MOCHI DUMPLINGS ARE EVERYTHING!! I HEREBY MOVE TO MAKE ALL DUMPLINGS MOCHI DUMPLINGS! The next morning we went out to visit Sanjūsangen-dō, a Buddhist temple filled with 1,000 life-sized golden statues of Kannon (similar to Buddha). You couldn't take pictures inside, but it was stunning! After touring the temple, we had a super fancy seafood kaiseki lunch back in Gion. It was SO good, but unfortunately we had to go to our tour and the meal ran later than we expected (plan for a good two hours of eating for kaiseki! ), so I was that rude American that left before dessert to run ahead to our tour guide. Ugh, I am still embarrassed! After lunch, we met up with our tour guide to visit a few temples in the Gion area - first Yasaka shrine, then Kiyomizu-dera temple and finally Kennin-ji, the oldest zen temple. For dinner - more ramen! Ippudo ramen is actually a chain (you can get it in NYC!) but we heard it was still some of the best and it definitely didn't disapoint! I don't know what most of the toppings were but they were delish. My travel motto: don't ask, just eat. Today we went to the west side of the city to explore some of the temples and gardens there. We started at Kinkaku-ji (the Golden Pavilion), which used to be the private residence of the shogun (kinda like a samurai king) in the 1400s. Then we visited Ryoanji for their famous stone zen gardens, and Ninna-ji. After touring the temples, we hit up the cutest little cafe for a late lunch at Cafe Bibliotec Hello. It was decorated floor to ceiling with books, and they made the yummiest little coffee drinks. I basically want to move in. I got a smoked chicken salad sandwich with greens and a Moroccan mint chai latte. After relaxing at the hotel for a bit, we went out to Monk for dinner, which turned out to be my favorite meal of the trip. It's this intimate little restaurant off the Philosopher's Path where the chef and one employee serve a seasonally focussed, five or seven course meal prepared right in front of you in this giant wood-fired pizza oven. Although there's Japanese influences, it's really more California cuisine. The chef goes to the farmer's market every morning and picks out what looks delicious, then plans his menu. Also, he made legit the best pizza I've had in my life! Started with a fresh pea soup served with pizza dough topped simply with fresh parm and olive oil, hot from the oven. Where the magic happens. The view from my seat. The BEST pizza I've ever eaten! He ferments his own starter to make the dough from locally grown wheat. Half was topped with anchovy paste, asparagus and mozzarella and the other half was topped with taranome, a bitter Asian green (I think it's also called angelica). For our last day in Kyoto, I really wanted to go for a run, so I took the train out west to Arashiyama to visit the bamboo groves. It's a little town on the outskirts of Kyoto, right on the river. I went for a run along the shady path then hit up the famous bamboo forests. It's so crazy to see! After that, I had some time before heading back to Kyoto, so stumbled into one of the temples, which happened to be Tenryu-ji, a UNESCO World Heritage Site famous for it's gardens. I could have spent all day wandering those gardens. Every little path you took was different, and every so often, you got the most stunning views of the nearby mountains. Back in Kyoto, my mom and I caught the train to Nagoya. By the time we got there, it was basically dinner time, so we just checked into our hotel and headed out to a nearby restaurant to get the best unagi (eel) in the city. You can order half eel, whole eel or two eels over rice. After you're done eating the unagi and some of the rice, they come by with a delicious broth to make a soup with your leftover rice. We spent our morning at Nagoya castle, which was built in the 1600s. The gardens were my favorite part. They were built on some of the ruins of the old castle, part of which was destroyed in WWII. Craggy rocks littered the gardens. We also got to tour the castle, which is almost done with a massive restoration project. After lunch, we went to the Noritake factory, gardens and museum, where they make Noritake china. We got lunch at their cafe in the outlet store. Afterwards we hit up the Toyota museum, which was kinda interesting, but also I'm not that into cars so I could have passed. My mom was pretty tired at dinner, so I wandered to nearby Nagoya Station for ramen. I just went with what had the longest line, and good call Rachel, because it turned out to be the best ramen of the trip. This one was made with two different types of noodles. One was these thick, chewy, curly noodles and the other were these broad, thin noodles with a silky texture. I want to dive into that bowl! Our last day was kinda a quiet day! I think we were pretty tired and ready to get home at this point. We slept in and spent the morning shopping for kimonos at a nearby department store where they sold consignment kimonos (new ones are pretty expensive!). I picked up a gorgeous orange and ivory printed one. After lunch, we went to the Tokogawa art museum, which actually had the best collection of any museum we went to. It displays the private collection of one of the major ruling families and literally ever piece was breathtakingly beautiful. Unfortunately you couldn't take pictures though! If you ever go to Japan, I think one day in Nagoya is perfect. Start at the castle then spend the afternoon at the museum and you'll be perfect! Phew, so was that sensory overload?? Would love to hear what foods you would love to try in Japan in the comments!